Study identifies mTOR pathway that controls cancer proliferation via nutrients. The mammalian target of rapamycin, a drug originally developed to prevent immunosuppression, is mTOR. mTOR is one of the most critical proteins in the control of cell proliferation, including cancer. For decades scientists have been researching mTOR to gain a thorough understanding of exactly how it regulates such an essential cell function that impacts metabolism, growth, protein and organelle recycling (autophagy), proliferation, and survival. Now, a new study from researchers at Sanford Burnham has identified a novel kinase cascade that regulates mTORC1, a protein complex implicated in the control of cancer cell growth in response to nutrients. The team state that the study provides further insight into the control of mTORC1 activation, and highlights several new potential drug targets to treat human pathologies linked to mTORC1 deregulation. The opensource study is published in the journal Cell Reports. Previous studies show that the mTOR gene produces one protein that forms two distinct complexes, mTORC1 and mTORC2. 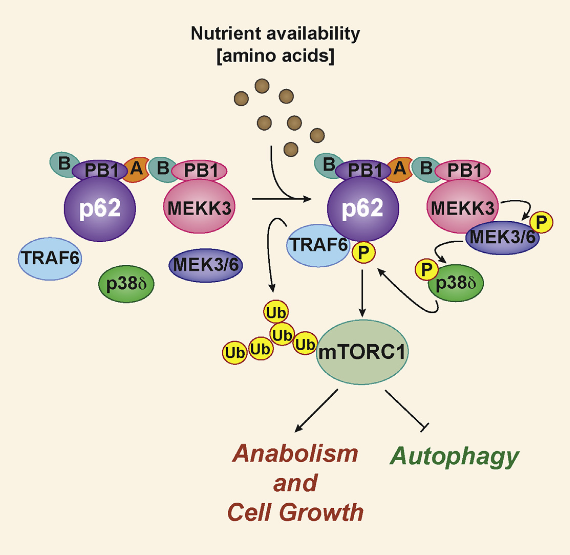 mTORC1 responds to nutrient availability and growth cues, and when activated (phosphorylated), leads to increased protein synthesis and cell proliferation. In contrast, mTORC2 appears only to respond to growth factors such as insulin, and is more important for overall cell survival. The breadth and pathological conditions where mTOR is implicated have led to extensive efforts to develop inhibitors of this important kinase in multiple studies. There are now a handful of FDA approved mTOR inhibitors, mainly rapamycin and its analogues, available to treat certain cancers, organ transplantation, coronary restenosis, and rheumatoid arthritis. However, since many of the drugs are dual inhibitors of mTORC1 and mTORC2, and because mTORC2 is involved in the maintenance of cell survival, however, earlier studies often identify life-threatening side effects. For this reason, the researchers state that the medical community is intensifying its efforts to further understand the initiation and control of mTORC1 signaling to develop newer, more specific, less toxic drugs that exclusively target this pathway. The current study included an analysis of MEKK3, p38-delta, and p62 in prostate cancer specimens, and found that levels of these proteins were more highly expressed in aggressive tumours with high Gleason scores (GS7-10), supporting the relevance of the findings in prostate tumorigenesis. The results showed that the phosphorylation of p62, a protein in the mTORC1 complex, is a critical event required to activate mTORC1 in response to amino acids, an environmental cue that signals the presence of sufficient nutrients to ensure cell growth. Data findings also show that tight regulation of mTORC1 activation is critical for normal cell growth and homeostasis. When the process becomes uncoupled from nutritional status signals, it can promote the progression of multiple pathological processes. The current study found that MEKK3 is the leading kinase in an amino-acid sensing cascade that includes MEK3/6 and p38-delta, and drives p62 phosphorylation, which is a critical step for mTORC1 activation in response to nutrients. The lab states that each of these kinases, MEK3/6, p38-delta, and MEKK3, either on their own or in combination, represent a potential target that could selectively modulate mTORC1 activity without inhibiting mTORC2 to potentially treat many human diseases. The researchers explain that the kinases directly phosphorylates p62 when cancer cells sense that they have nutrients to grow. In turn, p62 orchestrates the binding of components to create the mTORC1 signaling complex. The team surmise that the study identified p62 phosphorylation as the initiating signal, and elucidates the cascade of proteins and kinases involved. They go on to add that since it is known that kinases can be inhibited with small-molecules the findings may lead to new drugs that exclusively target the mTORC1 activation pathway, potentially circumventing the unwanted side effects cause by drug interactions with mTORC2. For the future the lab conclude have already identified MEKK3 inhibitors and are working to develop these compounds in parallel with screening small-molecule libraries for inhibitors of MEK3/6 and p38-delta. The mTORC1 complex is central to the cellular response to changes in nutrient availability. The signaling adaptor p62 contributes to mTORC1 activation in response to amino acids and interacts with TRAF6, which is required for the translocation of mTORC1 to the lysosome and the subsequent K63 polyubiquitination and activation of mTOR. However, the signal initiating these p62-driven processes was previously unknown. Here, we show that p62 is phosphorylated via a cascade that includes MEK3/6 and p38δ and is driven by the PB1-containing kinase MEKK3. This phosphorylation results in the recruitment of TRAF6 to p62, the ubiquitination and activation of mTOR, and the regulation of autophagy and cell proliferation. Genetic inactivation of MEKK3 or p38δ mimics that of p62 in that it leads to inhibited growth of PTEN-deficient prostate organoids. Analysis of human prostate cancer samples showed upregulation of these three components of the pathway, which correlated with enhanced mTORC1 activation. Amino Acid Activation of mTORC1 by a PB1-Domain-Driven Kinase Complex Cascade. Meco et al 2015.